Westy Copeland has been creating art now for over 40 years, developing a personal style that is colorful, whimsical, and quirky. After earning a BA in art at Middlebury College, she went on to earn her MFA in printmaking at RIT. Her paintings are meant to convey a mood, usually contemplative and/or happy, while at the same time alluding to the complexity of life. Her unique view of the world is presented through layers of color, shape, and texture. She “paints” her canvases with brushes, rags, stamps, stencils, and her bare hands, often incorporating old music, newspaper, book pages, and maps. The resulting layers of paint and images are a mirror of the layers of our lives, revealing the complexity of our world. Westy’s style of Modern Realism was influenced from a very young age by the likes of Picasso, Matisse, and Chagall, to name just a few. She paints because it’s her passion. 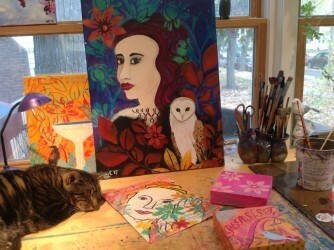 Every day is a new adventure in her warm, sunny, studio where the cat lolls about and the music plays…….